ScottMadden»Insights Library»Minute»An America First Coal Plan: Will Changes in U.S. Policy Favor Coal? An America First Coal Plan: Will Changes in U.S. Policy Favor Coal? Several weeks into the new administration, Trump’s energy policies, including those expressed in the “An America First Energy Plan,” are showing favor to the use of fossil fuels, indicating the potential for a rebound in coal use within the energy sector. While many in the coal industry have expressed a promising future, analysts have questioned whether the changes in direction from the Obama administration, including the repeal of the Clean Power Plan and other regulations, will result in any sustainable gains for coal. 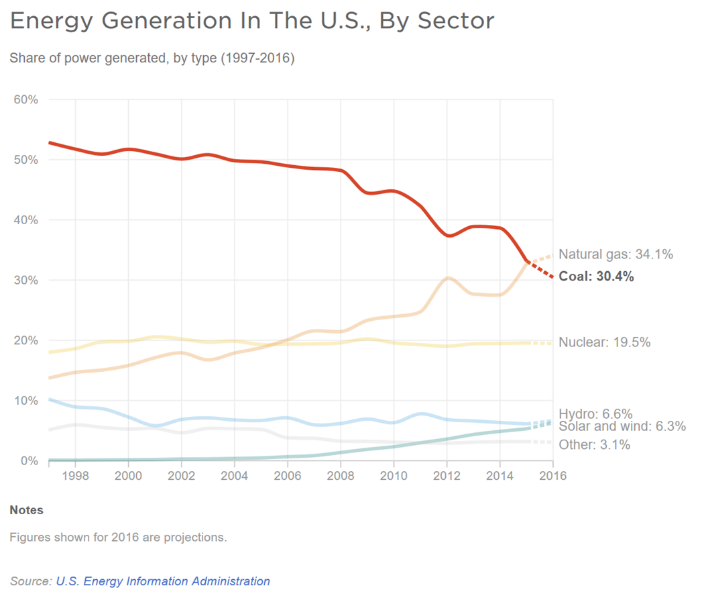 Less than a decade ago, the United States produced half of its energy from coal, but this level has declined nationally from about 44% of electric power generation in 2009 to 31% today. In 2015, U.S. coal production dropped 10.3% year-over-year to below 900 million short tons (MMst), the lowest annual production level since 1986. Production in the Western Region, representing 56.6% of total U.S. coal production in 2015, totaled 507.4 MMst, 6.5% lower than 2014. Also in 2015, the productivity capacity of U.S. coal mines decreased for the fourth year in a row to 1,165 MMst, a decline of 6.3% from the 2014 levels. In 2015, the average number of employees at U.S. coal mines decreased 12.0% to 65,971 employees, the lowest on record since EIA began collecting data in 1978. U.S. coal consumption of 798 MMst in 2015 was 13.1% lower from the 2014 levels. The electric power sector consumed about 92.5% of the total U.S. coal consumption in 2014 and 2016. Average sales price of coal from U.S. mines was $31.83 per short ton in 2015, 8.6% lower than the prior year. As listed above, several of the principal components of the “An America First Energy Plan” are focused on the easing of regulatory and access conditions for fossil fuels and, as such, they primarily address the market supply of fossil fuels and not demand. Easing of regulatory requirements are bound to provoke some increased domestic production, but analysts argue that any expansion in U.S. fossil fuel production as the direct, discreet result of such policies is likely to be only modest. This is because, in the current environment, fossil fuel production is relatively inelastic to supply-side measures. Although coal is somewhat elastic with respect to regulatory and access conditions (particularly to the Clean Power Plan and the moratorium of coal leasing in federal lands), it is far more sensitive to the evolution of the price of both natural gas and renewable energy. Many coal producers have expressed optimism thanks to recent greater demand, a better pricing environment for coal with a forecast of higher natural gas prices, and a congressional unwinding of rules cumbersome to the U.S. mining industry. Projections show a slight growth in domestic production of coal, but the impact of policy changes from the Trump administration are unclear as the coal market is tied to numerous factors outside of regulatory policy, including weather and competition from natural gas and other power generating sources. Electric-sector demand is currently projected to grow from 653 million tons in 2016 to 688 million tons in 2017, before moderating after 2018. Lower natural gas prices combined with additional coal generation unit retirements will tend to keep coal generation demand levels at or below 640 million tons per year through 2023. Accounting for the expected recovery in production and restoration of normal inventories in 2017, the overall coal market (domestic demand and exports) is projected to be essentially flat, at 19 million tons higher in 2023 than in 2016. Global momentum is picking up for the low-carbon transition, as the economics of renewable energy begin to pull policy with it. The increasingly favorable attitude toward renewable energies across many states will likely temper any inclination for excessive favoritism at the Department of Energy toward fossil fuels, or for an early end to the renewable energy tax credits. In summary, renewables, backed by newer competing technologies, and the low price of natural gas-based power generation in the United States, will be a significant challenge to coal-powered generation and any changes in policy geared to favor the use of the fossil fuel. This report is part of the Fossil Minute series. To view all featured Fossil Minutes, please click here.